Sung by the 12-voice Schola Cantorum of St. James by-the-Sea, Choral Evensong in an Anglican tradition is a magnificent act of choral worship. Drawn almost entirely from the Bible, its purpose is to proclaim the wonderful works of God and evoke from the worshiper a response of praise, penitence, and prayer. In the beautiful setting of St. Mary's Chapel at The Bishop's School, there is no better place to spend 40 minutes surrounded by God's presence in the beauty of sacred music. 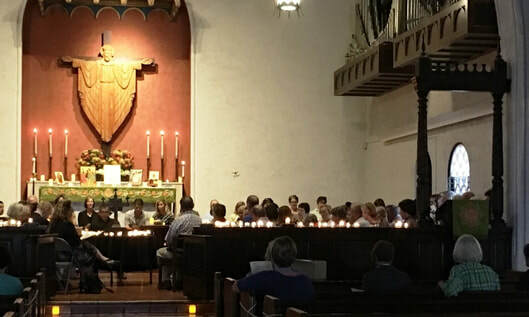 Drawn from the most contemplative of the monastic offices begun in the middle ages, Compline-by-Candlelight offers music from Gregorian Chant and early polyphony to the contemporary music of modern mystics. An offering of thanksgiving and a plea for peace, the voices of the Schola Cantorum of St. James, a professional choir of 12 voices, continues this tradition of night-prayer as an offering of tranquility for the whole community. This is a brief 25-minute service offered in St. James Church. Come experience the peace of Taizé (pronounced “teh-ZAY’). The service includes music of participation, often sung in short Latin phrases, so the mind is released from distraction, allowing the mind to focus on listening to God. To read a short history of Taizé click HERE.